As the famous intellectual products, Samsung galaxy series have excellent public reputation all the time. And which one is the most pervasive and special Smartphone recently or you desire to buy? Without doubt, the first Smartphone with a curved display could be very impressed in people's heart, which is Samsung Galaxy Round released by Samsung on October 10, 2013, in South Korea. It features a 5.7-inch, 1080p OLED screen and a signature curved screen. Besides, it is 7.9mm thick and 154g weight so that people can freely take it to anywhere. Moreover, it runs Android 4.3 Jellybean and has a 2.3 GHz Snapdragon 800 quad-core processor, 2,800mAh of battery, and 32GB of internal storage. The supported video formats are MP4, 3GP, MPEG-4, DivX, XviD, etc. The exterior of Galaxy Round is based on Galaxy Note 3 and the curve screen design is really suitable for watching video on the move. When you bought it, the first thing you must do is experiencing this unique curve display by playing a video on it. Of course, choosing a latest summer movie 2014 is highly recommended like The Lego Movie, Divergent, Need for Speed, etc. Most of time, these videos are HD video formats like MKV, MTS, TS, etc or SD video formats like MOV, FLV, F4V, etc. But the supported video formats for Galaxy Round are MP4, 3GP, MPEG-4, DivX, XviD, etc. So, you should figure out a way to convert video to Samsung Galaxy Round. 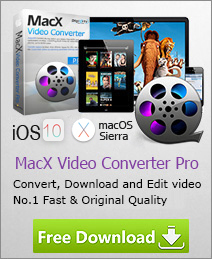 There is very convenient and useful software for you: MacX Video Converter Pro. With over 359 output profiles, it is capable of converting many HD and SD videos on Mac OS X including MKV, MTS, TS, MOV, FLV, F4V, RM, etc to any Samsung Galaxy smartphone like Samsung Galaxy Round, Samsung Galaxy Note 3, Samsung Galaxy S5/4/3 which is one of the best phones in 2014, Samsung Galaxy S4 Active/S4 LTE and so on. 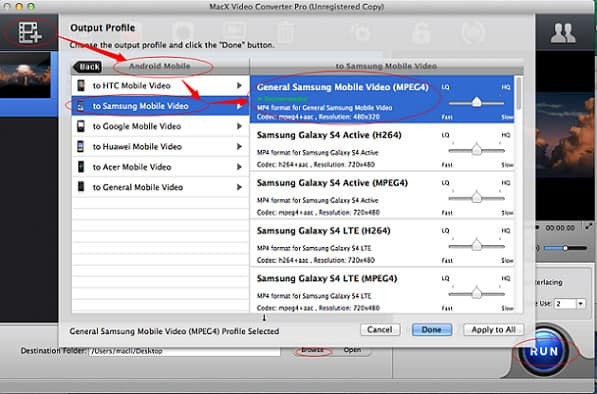 Input video by clicking "Add File" or simply drag and drop video to the main interface of Samsung Galaxy Round Video Converter. Select Samsung Galaxy Round in output profile which is in the Android device category. Choose the destination folder by clicking "Browse" for saving the target video file. Start converting by clicking "RUN" and finish the conversion of video to Samsung Galaxy Round on Mac. Generally, owning the 32X faster conversion speed based on multi-core CPU use and no quality loss features, this Samsung Galaxy Round Mac video converter will help you get a wanted video format in a short time by converting video to Samsung Galaxy Round. Then, you can enjoy any video on the curve display screen at anytime and anyplace. Which one do you prefer between Samsung Galaxy S4 Mini and HTC One? Here is the detail review about them. Dying to convert video to Samsung Galaxy S5 on Mac? Here will show you how to use a solid Samsung Galaxy S5 video converter to worry-free transfer video to Samsung Galaxy S5.